Wall Street stocks tumbled Wednesday after the Federal Reserve lifted interest rates while pledging a cautious approach to additional interest rate hikes next year. 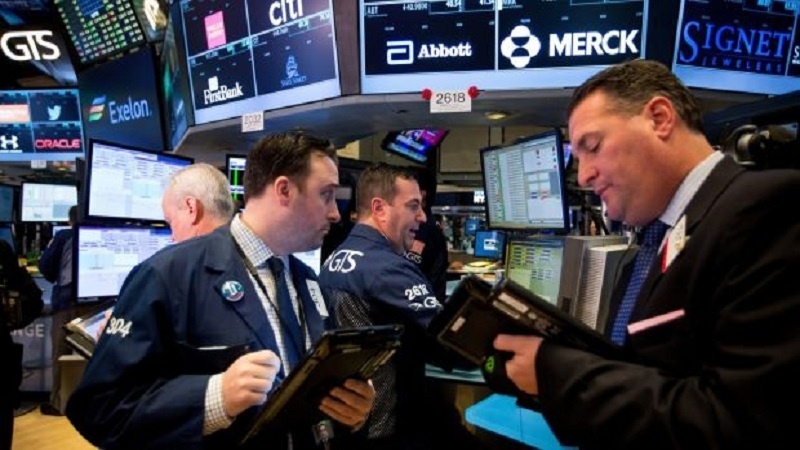 According to Press TV, the Dow Jones Industrial Average dropped 1.5 percent, about 350 points, to 23,323.66. The broad-based S&P also shed 1.5 percent to 2,506.96, while the tech-rich Nasdaq Composite Index sank 2.3 percent to 6,636.83. The declines left all three indices at fresh lows for 2018. Heading into the announcement, many analysts had expected a “dovish” interest rate increase paired with strong verbal cues that the Central Bank would not tighten excessively in a period when global stocks have retreated amid concerns over slowing growth and trade wars. But Sam Stovall, Chief Investment Strategist at CFRA Research, said the Fed and Chairman Jay Powell did not go far enough to assuage markets. “Investors were expecting the Fed to be even more dovish in its comments and actions,” Stovall told AFP. The Fed, as expected, raised the target range by 0.25 point, with 2.5 percent at the high end. But The Fed now projects only two interest rate increases, down from three previously. Powell said the Fed would not shift course on its path of reducing the Central Bank’s balance sheet. Some analysts thought the Fed could signal flexibility on that measure to placate investors. “Powell was in a lose-lose situation,” said Jack Ablin, Chief Investment Officer at Cresset Capital Management. Losses were fairly broad-based, with Apple shedding 3.1 percent, Chevron 1.7 percent, 3M 2.4 percent and Walgreens Boots Alliance 2.9 percent. Companies with outsized falls included FedEx, which plunged 12.0 percent after slashing its profit forecast due to weakness in China and other key overseas markets. Facebook dived 7.3 percent following new revelations over its data sharing practices with Amazon, Microsoft and other technology behemoths. The company was also sued by the attorney general of the US capital Washington over alleged privacy violations. But General Electric gained 5.4 percent following an upgrade by Vertical Research Partners, which described the company as a good investment bet after a steep fall in value. The gains also came after a Bloomberg News report that the company is moving towards spinning off its health care division.